How to dress at the office in summer? It is june and summer is coming! (Well actually in Paris, it is raining and I am freezing cold, but let’s pretend it’s hot). Summer is great, we all agree on that, but we also all wish that we were sunbathing on the beach rather than beeing stuck in our sticky hot office, right? Plus, one of the big problem of this situation is to manage to dress well without beeing uncomfortable. Which is especially an issues here in Paris where only a few offices have air conditioning. Of course, our offices do not all have the same “rules”: while some women have to respect a very strict dresscode, other lucky gals can do pretty much whatever they want. Put – at least a bit – your personal style into your outfit: it’s not because there is a dresscode that we all have to look like clones! 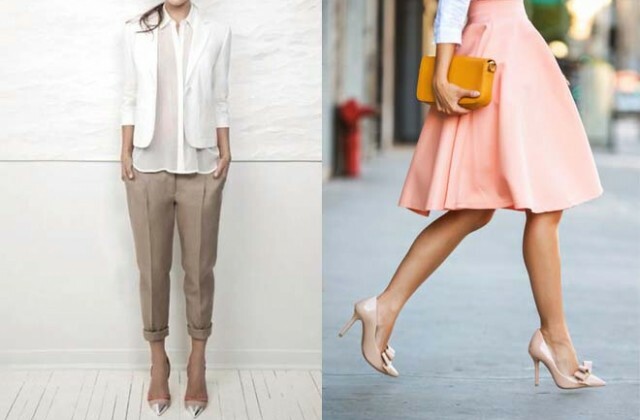 Let’s get you inspired with some outfits I created for all kind of offices and of women. Everyone around you wears blouses and tailored items and men all suit up. With such a dresscode, lots of women go for grey, black and white and dream of the day they’ll be wearing all the rainbow colors they wish. If you are in this situation, remember that those colors do not always look dull and that they are lots of ways to spice them up! You can for instance inspire from men who put all the fun in the tie and prints. Do the same and add some interesting details to your classic outfit. If you want to pull out more colors, it’s also fine: just stay on the chic side with classic and classy cuts. And remember that good fabrics are a must when you have this kind of dresscode. Just be careful not to appear tacky or neglected. Dress up to what you do: in advertising or in fashion excentric looks can make you stand out in a good way. Have you found some new outfit ideas to wear at the office this summer? You can find it on Etsy here. It’s a girl who creates her own custom blend nailpolishes (how cool is that). I absolute adore your post. I’ve read everything and it’s just so inspiryng. Yes it makes perfectly sense! Think about doing that soon.